Serving a fourteen county region surrounding Cookeville, TN, the Upper Cumberland Reconnect joined the Network in 2015. The work is critical because of its ripple effect. Increasing the education attainment level of our region will have continual positive impacts that will affect generations of Upper Cumberland residents and businesses for years to come. We are passionate about supporting adult learners as they turbocharge their careers. The result is a skilled workforce and an economy positioned for success. Building a strong, viable workforce is the key to breaking the cycles of unemployment and poverty. For adults to succeed, to realize their dreams, to set examples of accomplishment and tenacity for their children – these are the reasons this work matters. The Highlands Economic Partnership’s Workforce Development and Education Steering Committee and the Cookeville-Putnam Chamber of Commerce are the pivotal partners who initiated the Upper Cumberland Tennessee Reconnect movement. 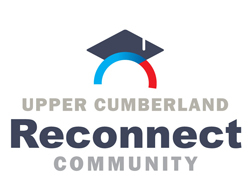 The goal of the Upper Cumberland Tennessee Reconnect Community is to reach 4,000 adult learners across our 14-county region by 2025. This goal aligns with Governor Haslam’s Drive to 55 Initiative – to equip 55 percent of Tennesseans with a post secondary certificate or degree in the next ten years in order to better prepare our workforce, reduce unemployment and improve our quality of life. We are a small, rural community with a big city mindset. We are small enough to work well with each other, but diverse enough to appeal to people from all walks of life who are determined to make our community a great place to work, play and live, thereby attracting more and more businesses and industry. The Upper Cumberland is a playground for adventure enthusiasts, with beautiful state and local parks, cascading waterfalls, pristine rivers and lakes, and one of longest cave systems in the US. We proudly lay claim to the “Home of American Music” in Livingston, “The Golf Capital of Tennessee” in Crossville, and “Tennessee’s Best Donuts” in Cookeville. Though the area is scenic and filled with Southern charm, it truly is our people and the way we collaborate that make us both unique and successful. The question is, “What is best for the Upper Cumberland?” The answer is found in our people, who work to make our community a better place for each and every one of us. Director and five part time advisors. Improve the quality of life across the Upper Cumberland through postsecondary education. Consistently encourage and support adults to complete postsecondary degrees or diplomas, by providing resources and guidance, resulting in enhanced workforce development in the Upper Cumberland.